* The list of derived data now includes covers a) air kerma rates Kair; b) exposure rates X; and c) ambient dose equivalent rates H*(10) for approximately 1500 gamma and x-ray emitting radionuclides (depending on the database used). * The threshold energy used in the calculations for dose quantities can be set (in the Options) by the user to investigate the effect of low energy photons on the dose calculations. * The results are for single nuclides only. In this application, no account is taken of short-lived daughters. 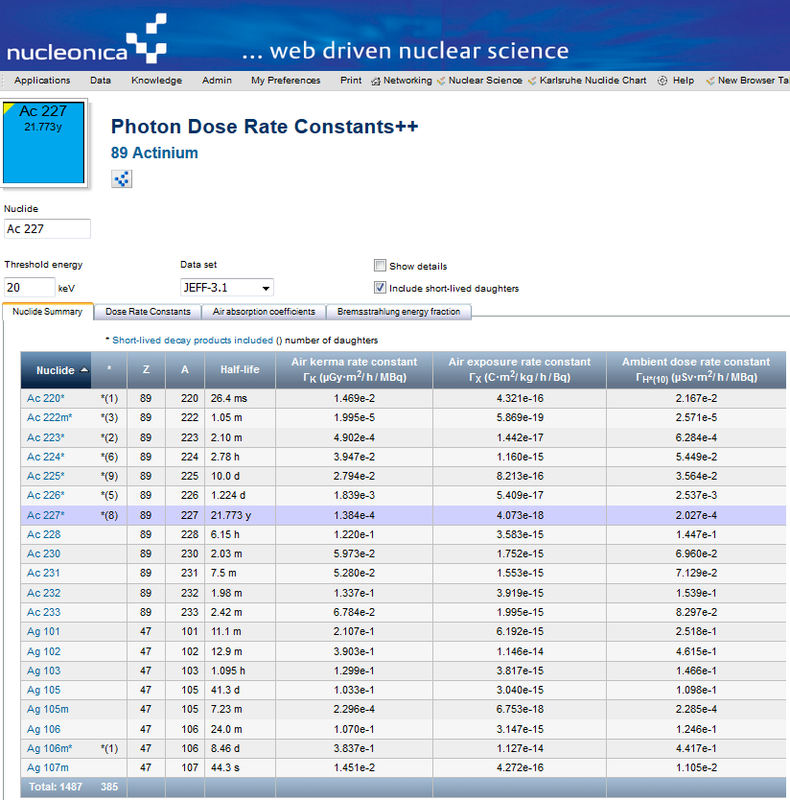 To obtain the results including short-lived daughters the user should use the Photon Dose Rate Constants application. Derived Data showing the new dose quantities. 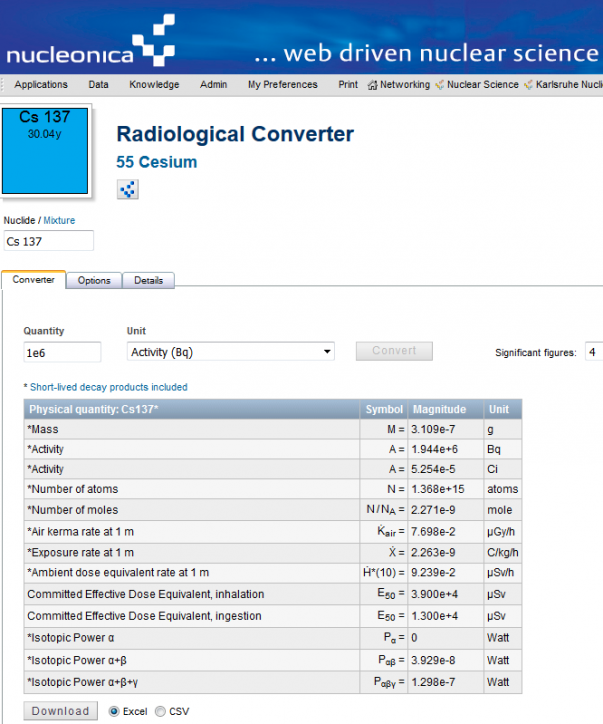 * The list of conversion quantities now covers a) air kerma rates Kair; b) exposure rates X; and c) ambient dose equivalent rates H*(10) for approximately 1500 gamma and x-ray emitting radionuclides (depending on the database used). * The threshold energy used in the calculations for dose quantities can be set by the user to investigate the effect of low energy photons on the dose calculations. * Account is taken of short-lived daughter nuclides when a parent nuclide is selected indicated with a * e.g. Cs137*. Radiological Converter showing the new dose quantities. A key feature is the inclusion of short-lived daughters in the calculations as indicated by an asterisk * before the physical quantities and following the nuclide name e.g. Cs137*. The new Photon Dose Rate Constants++ application in Nucleonica allows the user to calculate the internationally accepted Ambient Dose Equivalent Rate Constants, Air Kerma Rate Constants, and Exposure Rate Constants for approximately 1500 gamma and x-ray emitting radionuclides. These quantities are useful for estimating the dose rates from point sources where attenuation and scattering in the source and in air are negligible. From the dose rate constants, the ambient dose rates H*(10), air kerma rates Kair, and exposure rates X can then be obtained. For the calculation of the dose rate constants, some nuclides are considered to be in equilibrium with daughter products. This is the case when a single radioactive decay chain in which radionuclides are present in their naturally occurring proportions, and in which no daughter nuclide has a half-life either longer than 10 days or longer than that of the parent nuclide, shall be considered as a single radionuclide. 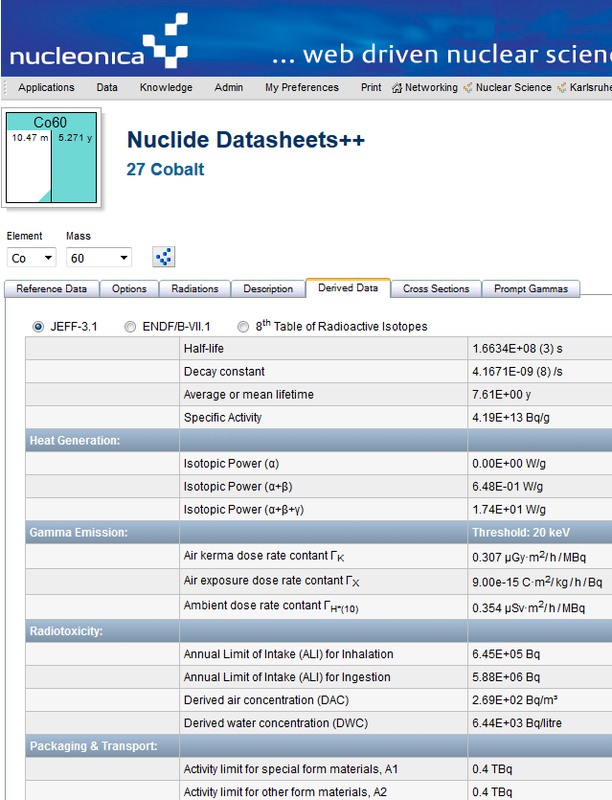 Additional features of the application are that 1. the underlying dataset used in the calculations can be selected from a list of international nuclear datafiles (JEFF3.1, ENDF/B-VII.1, etc.) and viewed in the results grid; and 2. the threshold energy used in the calculations can be set by the user to investigate the effect of this on the calculation results.